Democracy Falls - a hub of opportunity for those in the Cursed Earth with the skills, gear and guts to try and survive within its gang-patrolled wall. Located a few hundred miles west of Mega City One on the ruins of one of America's ancient heartland cities. The Justice Department has always turned a blind eye to the existence of Democracy Falls, choosing to use its resources more efficiently than laying siege to it. The appearance of a new criminal sport in the city has changed the status quo, forcing the Chief Judges to take action. This new sport, called the Bloodrace, is known to have started in Democracy Falls - and it just claimed its first Judge's life. ...the only problem is getting back out again. 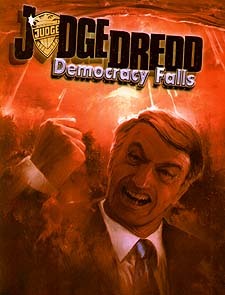 Democracy Falls is a scenario for the Judge Dredd: Traveller game setting, placing several Judges in a dangerous and foreign city in the Cursed Earth, where fast cars and faster bullets are normally the Law of the land.